After a full slate of games, there’s a lot of work to be done for players and teams around the NFL heading into preseason Week 2. This time of year is a pressure cooker for everyone. But some players in particular find themselves in need of a big-time breakthrough. We’ll be focusing on that group for the purposes of this list. These 21 players all need to step up in a big way heading into preseason Week 2. McCarron wasn’t bad Thursday night during his team’s first exhibition game of the summer. 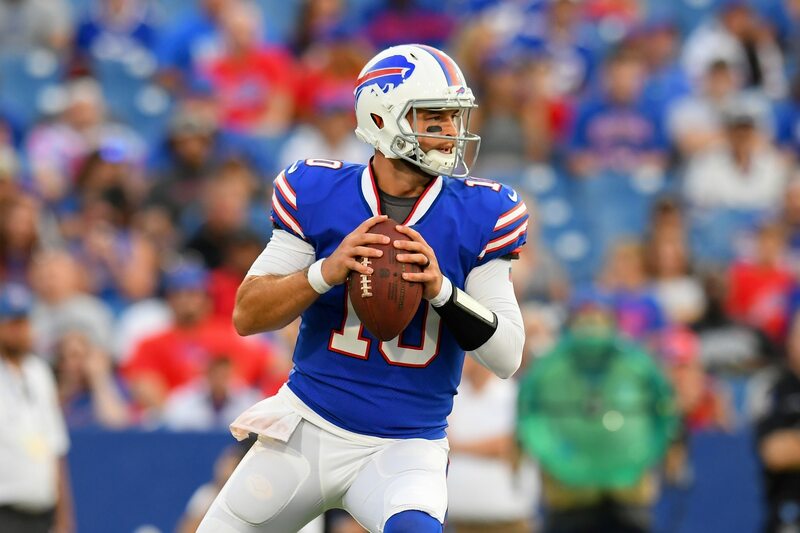 The issue he’s facing now is that his main competition for the starting job — Nathan Peterman — had a very strong outing, especially on the game’s opening drive dishing to the team’s top receiver, Kelvin Benjamin. This has been the big issue for McCarron since joining Buffalo. He’s just simply done nothing that screams “Start me!” If he has any hope of earning the starting job, then the former Cincinnati Bengals backup needs to step up in a big way and prove it in the coming weeks. The Falcons picked Riley up in the third round of last year’s draft, and early last season it looked like he might become a key playmaker lining up next to former LSU teammate Deion Jones. Then Riley suffered a knee injury, missed four games and struggled mightily the rest of the season. So far, it’s looking like Riley’s closer to being cut than becoming a starter again. He was responsible for Isaiah Crowell breaking loose for a touchdown in the first quarter Friday night. He also had a bunch of missed tackles and generally looked to be a second too slow diagnosing plays in the first preseason game. The Rams already have their young franchise passer in Jared Goff, who broke out in a big way last year under new head coach Sean McVay. That being said, based on what we saw last year and then again Thursday night, the offense will become as one-dimensional as they come if Goff (heaven forbid) suffers an injury, because Sean Mannion hasn’t done anything to suggest he’ll be a capable backup. Mannion’s showing Thursday against Baltimore was about as bad as they come. 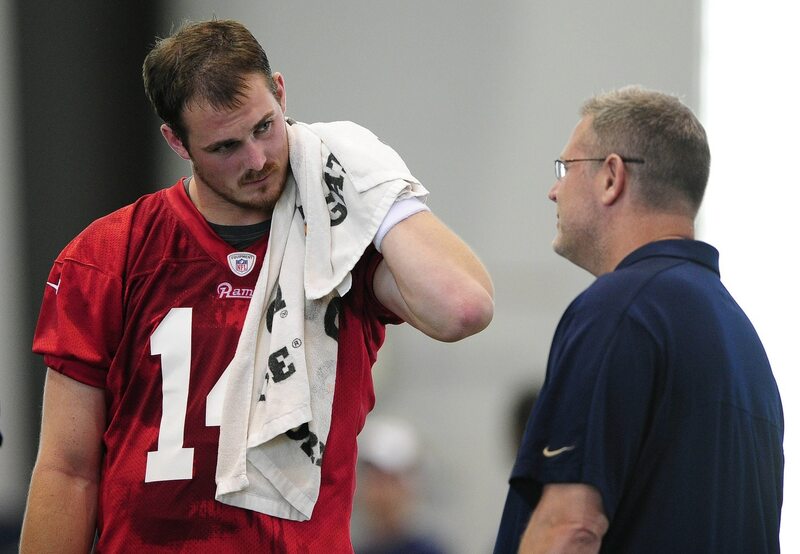 And with former sixth-round pick Brandon Allen being the backup to the backup, Mannion needs to step up in a big way or find himself looking for work later this summer. Last season, Tampa Bay suffered through some pretty awful kicker troubles. It’s almost as if those issues came back to haunt the Bucs in the first preseason game, as Chandler Catanzaro missed an extra point and a 53-yard field goal in Thursday night’s game against Miami. Catanzaro’s poor outing prompted Tampa Bay to work out free agent Nick Rose, which is a really frustrating development considering the team just doled out a three-year, $9.75 million contract to Catanzaro as a free agent this summer. Needless to say, the kicker has some serious pressure on his shoulders right now to get right — right now. After a rookie season that had many wondering if Ross was a bust already, the former Washington Huskies star has been impressing so far in camp. 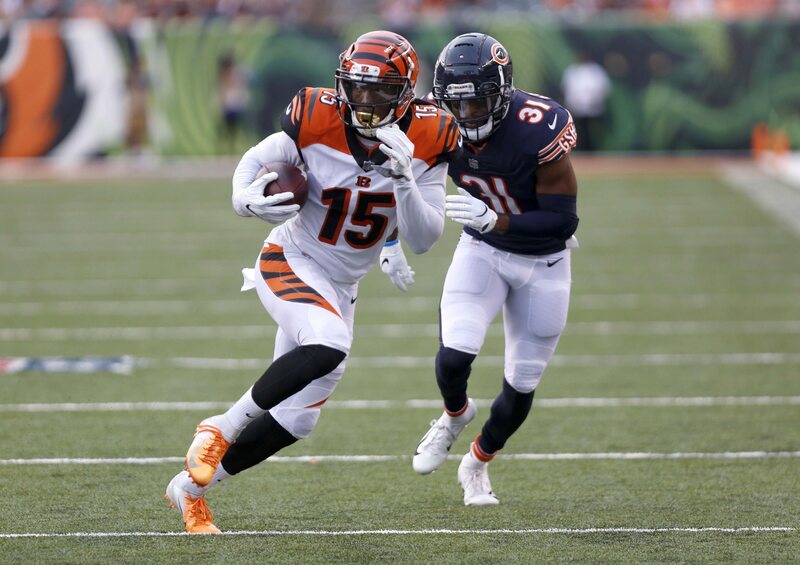 On Thursday night as the Bengals took on the Chicago Bears, an early mistake had fans groaning once again (watch here). The good thing is that Ross did rebound to make a very sweet play shortly afterward — a 20 yard catch and run that showed off his impressive speed. Unfortunately, he only had that one catch on five targets (though he did nearly catch a touchdown), showing he has plenty of work to improve his stock. An extremely talented back out of Arizona State, Ballage combines outstanding overall athleticism with some serious size (6-foot-2, 228 pounds). He wasn’t heavily utilized during his playing days at ASU, but pro scouts were very intrigued with his NFL potential. On Thursday night, Ballage got his chance to really show his stuff as the primary ball-carrier for the Dolphins. And he showed a lot of good stuff. Unfortunately, he also fumbled at the tail end of one of his best runs. Then on Sunday during practice, he was booted out of the huddle by Ryan Tannehill over a missed assignment. Clearly, he has a lot to learn, and he’ll need to learn fast to have a chance of making a big impact for Miami this year. The Giants famously passed on Sam Darnold this spring, taking running back Saquon Barkley instead. They did this because they believe Davis Webb has what it takes to one day take over for Eli Manning. Or at least that’s been the talking point all offseason. Webb didn’t make the organization look very smart on Thursday night against the Cleveland Browns. He had an awful game, going for just 70 yards on 9-of-22 passing, and was wildly off the mark far too often. Rookie Kyle Lauletta had a much better game, and if Webb doesn’t rebound quickly he might just find himself taking a step backward on the team’s depth chart before too long. 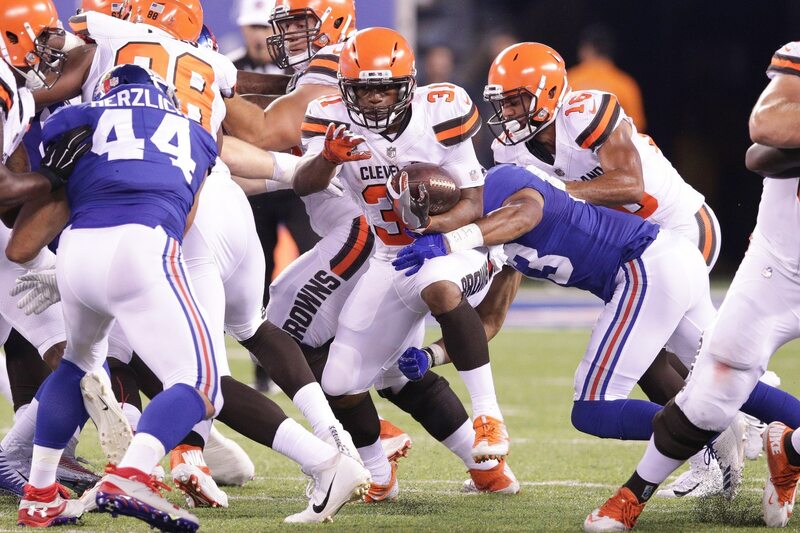 The Cleveland offensive line didn’t do Chubb any favors Thursday night as the Browns took on the Giants. That said, the rookie out of Georgia was pressing, showing some impatience while struggling his way to just 11 yards on 15 carries. Granted, Carlos Hyde didn’t go anywhere on the one carry he had before exiting the game early, but this wasn’t what Chubb needed to do in order to win the starting job over Hyde. It’s telling that, in 15 carries, Chubb’s longest run was just four yards. He’ll need to seriously boost his production in the coming weeks. Players who are longshots to make the roster cannot afford to make blatant mistakes. Phillips, who was an undrafted rookie out of Tarleton State University back in 2014, is definitely a player fighting to stay on the right side of the bubble in Pittsburgh. During the team’s first preseason game, however, he did not help himself on that front. Phillips was burned badly by Philadelphia Eagles receiver Shelton Gibson, who went 63 yards for six points in the second quarter. Then later on, Phillips had a chance to redeem himself somewhat but dropped an interception. These are the kinds of impact plays that have to go the other way in the coming weeks for Phillips. So far, it’s looking like Jones will open the season as the backup to Peyton Barber. Rick Stroud of the Tampa Bay Times recently reported that Jones has struggled in pass protection during practice, and that his hands need to get softer as a receiver. Then on Thursday when the Bucs took on Miami, Jones was very ineffective as a runner minus his touchdown in a goal-line situation that was more about the blocking up front than him. He also had a bad drop in the passing game and finished with just nine total yards on eight carries. The Bucs definitely want Jones to be able to contribute early, and often. His game-breaking speed cannot be taught. But he’ll have to do better than this to earn the trust of his coaches and teammates. 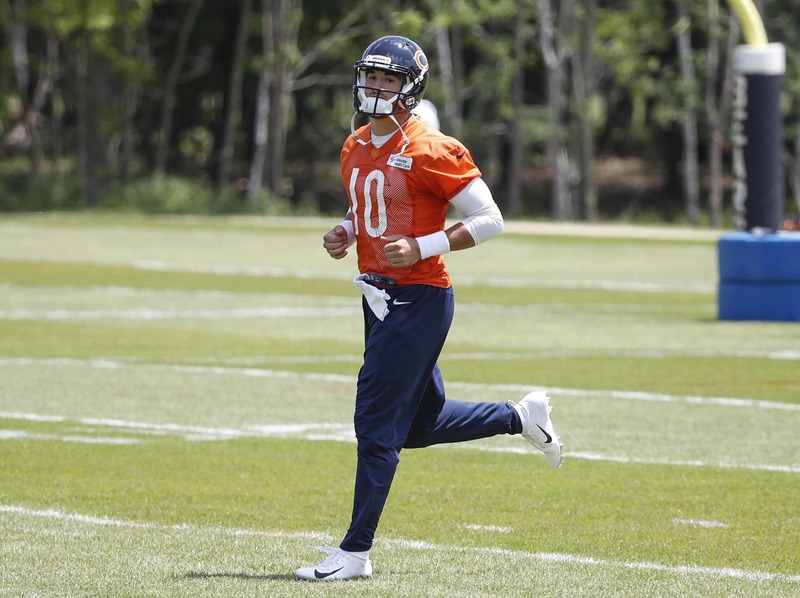 Through two preseason games (Chicago played in the HOF Game and has one more than other teams besides Baltimore), we still have no idea what to make of Trubisky and the new-look Bears offense. The reason for this is that Trubisky didn’t play in the first exhibition game, and he barely played Thursday night against Cincinnati. If we’re being honest, Trubisky didn’t exactly impress in the two drives he led, either. The offense gained just one first down in those drives, and that came by way of a penalty. He finished with four yards on four attempts, and he was sacked. Needless to say, Bears fans must be wondering if they have reason to be excited about the 2018 season, or if they should gear up for another rough campaign. This next preseason game should tell us more about all that. It wasn’t long ago that Eagles beat writers were touting Pumphrey as one of the best young players in camp. Then he hobbled off the field last Tuesday in practice, missed the team’s first preseason game and is reportedly in danger of not even making the team’s 53-man roster. Whew. Needless to say, Pumphrey needs to get healthy, stay healthy and do some pretty amazing things in the coming weeks to avoid being cut before the regular season. Former Nebraska Cornhuskers star quarterback Tanner Lee, who was a sixth-round pick by Jacksonville this past spring, had a brutal first outing in the NFL. He was sacked five times, fumbled twice and lost one of them, and he completed just half his passes against New Orleans on Thursday night. Meanwhile, Cody Kessler, recently acquired in a trade with Cleveland, shined as the backup to Blake Bortles. It’s possible that Lee could end up on the practice squad this year, if the Jaguars like him enough. But at this point it seems like it’s a stretch to think he’ll land on the active roster, at the very least. Baltimore’s 2015 first-round pick has teetered dangerously close to being permanently labeled a bust early in his career. And in the team’s first preseason game, he did absolutely nothing to suggest that he’d break free of that label, either. Perriman did have a very solid game for Baltimore on Thursday against the Los Angeles Rams, however. 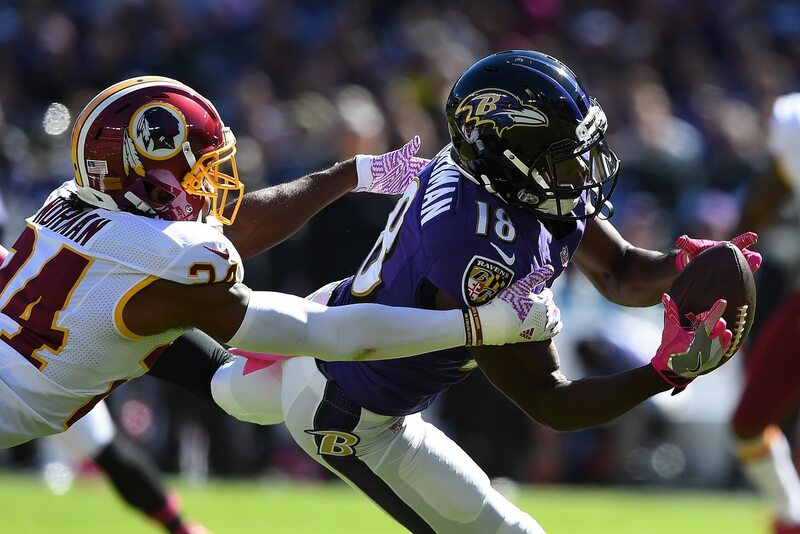 Hauling in three of the four passes that came his way, Perriman went for 71 yards to lead the team and caught a gorgeous 32-yards touchdown pass in the fourth quarter. If he can continue to build off this success, then Perriman might just have a real shot at making the final roster this year. The Packers have a pretty fierce competition brewing right now for the backup spot to Aaron Rodgers. Brett Hundley looked much improved when he played Thursday against Tennessee, despite a couple of turnovers. DeShone Kizer also had some really strong moments, including a gorgeous 51-yard strike to Marquez Valdes-Scantling. In the end, Kizer piled up 134 yards on 9-of-18 passing, taking two sacks along the way. It was a promising showing but one that also highlighted how raw he still is as a professional quarterback. If he’s going to unseat Hundley as Rodgers’ backup, then he’ll need to continue improving when he has his chances in the next three games. There were a couple of runs Penny made against Indy that gave Seahawks fans reason to be excited. But for the most part, he was underwhelming, coming no closer to unseating Chris Carson for the starting running back job. He gained 23 yards on 10 touches in total, averaging just two yards per carry on the ground. If anything, Mike Davis was much more impressive. The Seahawks shocked everyone taking Penny in the first round of April’s draft. So far, he has yet to prove he was worth it. 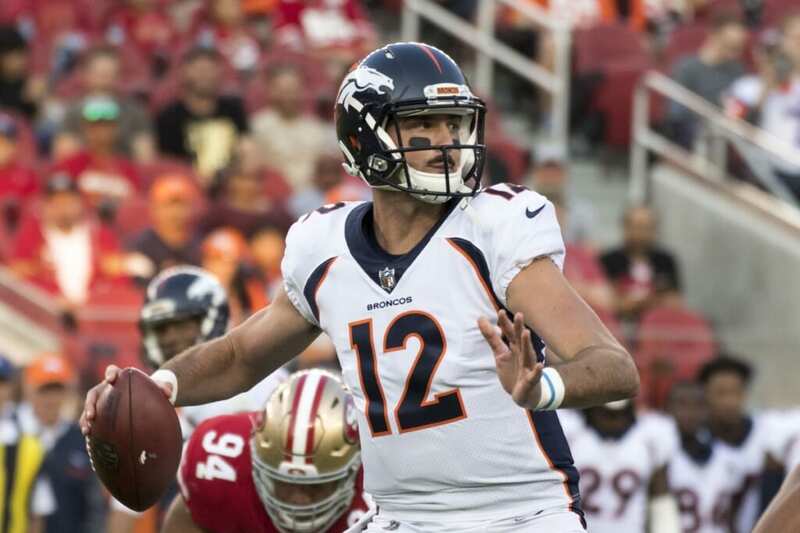 So far this summer, the biggest hype surrounding Paxton Lynch is that he’s still the biggest mistake John Elway has made thus far as general manager. He still runs around like a chicken with its head cut off if his first read isn’t open and the slightest bit of pressure develops in front of him. He still makes mind-boggling decisions to unnecessarily throw into double coverage. We saw all of that in the team’s first preseason game, as Lynch threw a pick on his first throw and was otherwise ineffective throughout the contest. It’s no wonder that head coach Vance Joseph isn’t discounting potentially giving Chad Kelly second-team reps in the next preseason game. Lynch needs to step up his game, and fast, to avoid being jettisoned in Denver. The Colts had big dreams about what Hines could do in the return game. Unfortunately, his rookie debut against Seattle was nothing short of a disaster on this front. Hines mishandled two punts and had to take a knee on a kickoff return after muffing that, too. The rookie out of North Carolina State also struggled in the run game, going for seven yards on three carries, and was not targeted in the passing game. Given Indy’s serious depth issues at running back after Marlon Mack’s injury, it’s time for Hines to step up in a big way. The Chargers haven’t had a capable backup to Philip Rivers in years. He’s stayed healthy, which has mitigated that quite a bit. But that doesn’t mean Los Angeles doesn’t need a security blanket, either. Right now, Geno Smith and Cardale Jones are fighting it out for that role. And on Saturday night, neither one of them did much to secure it. Jones was very ineffective, going for 50 yards on 6-of-12 passing with a lost fumble. Smith fared well in the yardage department and threw a touchdown late in the third quarter. But he also threw an ugly interception and lost a fumble of his own. One of these guys needs to take the bull by the horns here and give the Chargers some stability behind Rivers. Sure. We get it. Garoppolo only played for one drive in the first quarter before giving way to C.J. Beathard. It’s not much to go on. But this quarterback has perhaps more pressure on his shoulders than any other player in the league after signing one of the richest contracts in NFL history following just seven career starts. 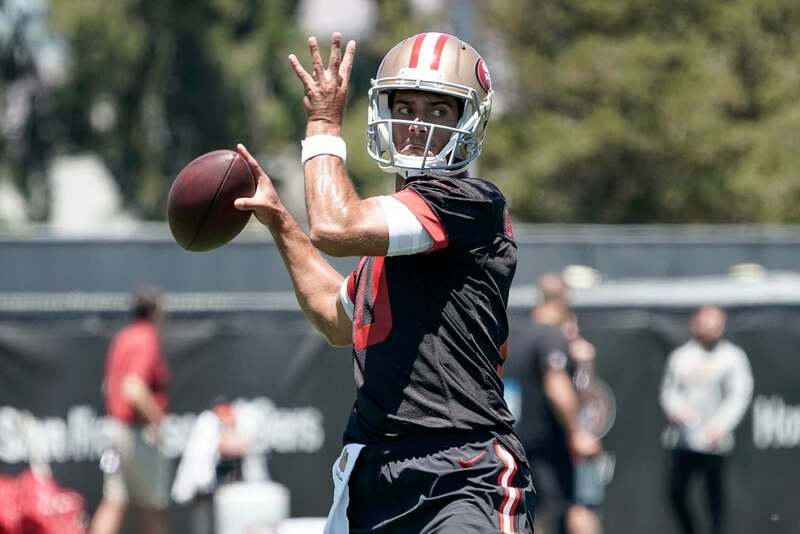 Garoppolo showed some nerves, missing on a couple of throws you’d expect him to make. One of those ended with his tight end, George Kittle, on the ground with a shoulder injury after attempting to stretch out for the overthrown pass. It’s going to be fascinating to see how Garoppolo handles this burden throughout the preseason and into the regular season. There is so much hype surrounding the 49ers right now, and most of it has to do with Garoppolo. If he flames out, then this organization will be right back where it started before making the trade for him last year, except it won’t have nearly as much financial flexibility.